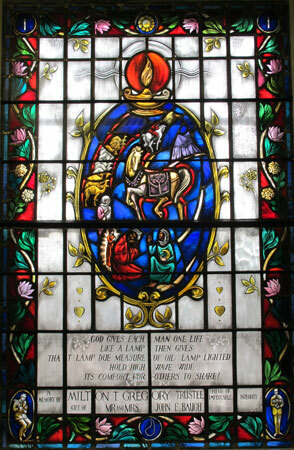 The first window is in memory of Joseph Hugh Flood, III, grandson of Daphne and Jack Herring (Director of the Armstrong Browning Library from 1959 - 1984). The poem, "The Boy and the Angel," is about a little boy who was ardent and persevering in his praise of God. 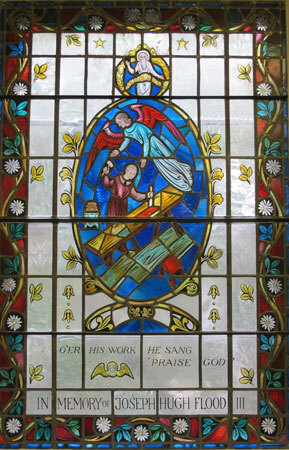 The child was so industrious and busy as he worked in a carpentry shop, and yet at the same time so sincere and so constant and persevering in his praise of God that God and certain angels took notice of him, thus the quotation on the window: "O'er his work he sang 'Praise God.'" The angels, seeing God's preference for the boy's praise, decided to perform a miracle regarding the child. The angels arranged for the lad to become a priest and live a life of religious training; meanwhile one of the angels replaced the child in the carpentry shop so that he was never missed. Eventually the boy grew up from priest to become Pope. As Pope, he praised God in "that great way" in St. Peter's in the Vatican, seated on the papal throne. But God was displeased. He preferred the innocent and human, though flawed and imperfect voice of the sincere child to the trained, "perfect," formal praises from the Pope. 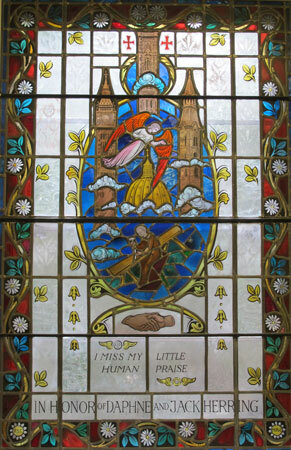 The poem comes to a climax with God's declaration: "I miss my little human praise," the quotation incorporated into the second window. 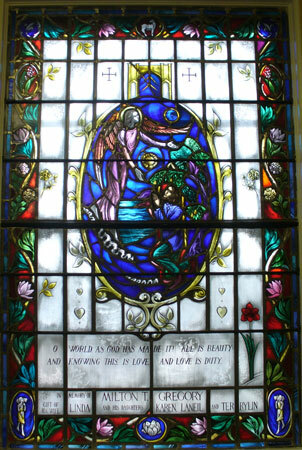 Given by a long-time Baylor friend, this second window honors Daphne and Jack Herring and contains images that convey their long association with Baylor University, their hometown of Waco, and their love of travel, especially the journeys to England and Italy as they conducted literary tours. Incorporated into the main medallion of the window are London's Big Ben, Giotto's bell tower in Florence, a Baylor University spire, and an angel hovering over the dome of St. Peter's Basilica in Rome while the boy works below. Beneath the medallion are "clasped hands"--reminiscent of the bronze sculpture of the Brownings as they held hands (also a trait of the Herrings). Featured in the borders of the two windows are daisies, inspired by the name of the Waco High School yearbook, The Daisy Chain. Jack Herring and Daphne Norred were high school sweethearts and graduates of the school. The theme established in the windows dedicated to "The Boy and the Angel" is: God needs and appreciates and enjoys the earnest, unrewarded, though imperfect, praise and service from humans--even weak humans. It is mainly and perhaps only through humans that God's work on earth is to be done. The two windows in memory of Milton Gregory (1913 - 1988) bear out this theme, recognizing him as one of those humans who was doing God's service on earth. The first window features Hoseyn's beloved Arabian horse, Muleykeh, with her whitened forefront. Hoseyn is seated on the right and pictured with a moon on his breast. This indicates the energy Muleykeh gives him: "On his breast a moon-like piece, some orb which of night makes morn." Duhl, in rich robes, kneels before Hoseyn in a begging attitude. Duhl's son is shown emitting rays: "The oil of your lamp is your son." The wife and son recall Duhl's efforts to beg for the horse. The camels represent his efforts to buy Muleykeh. Finally, in the upper right, Duhl is shown stealing Muleykeh and riding from Hoseyn's poor nomatic tent towards the ridge of El-Saban. "A lighted lamp" shines at the top of the medallion. When Hoseyn speaks the line quoted in the window, he is talking to his "friend" Duhl. Hoseyn continues his statement with: "The oil of your lamp [Duhl's] is your son: I shine while Muleykeh lives." A basic analogy has been established--each person's life is like a lamp. The fuel, which provides light from the lamp, is the oil. The oil is equivalent to the inspiration, the energy, the stimulation to action and to service. The light is the service, the helpfulness to others. The poem has an ironic ending: Hoseyn would rather lose his beloved Muleykeh than have Muleykeh beaten in a race! Hoseyn gives the thief, who is stealing Muleykeh, the secret which enables the thief to escape the pursuing Hoseyn, who is riding an inferior horse. Muleykeh is the oil (inspiration) of Hoseyn's lamp (life), mainly because she is unbeaten; Hoseyn sacrifices ownership of Muleykeh in order to preserve Muleykeh as superlatively great, unbeatable. Milton Gregory's source of energy, his inspiration, was his love of family, Baylor, Browning, Dr. Armstrong, beautiful things. He wanted Baylor and the Armstrong Browning Library to be great, often providing financial support himself or influencing others into action. References to the over-all theme are reflected in the border with the oil cruse and the sun at the top. In the lower left corner, Robert Browning is writing verse, which was his light, and in the lower right corner, Milton Gregory is holding the Armstrong Browning Library, whose ideals inspired him (his oil) and to which in turn he offered his support (his light). The pearls at the bottom recall another name for Muleykeh, as well as being rare and precious. The roses in the border suggest love and the magnolia, love of nature and magnificence. Its comfort for others to share!" Robert and Elizabeth visited Fano, Italy, where Browning was inspired to write "The Guardian Angel: A Picture at Fano." In the poem, Browning wishes that the Angel in the painting could step down, place the angelic hands on his throbbing head, heal his pain, and clear his vision. In this window, Robert Browning kneels in the same position as the boy in Guercino's painting, "L'Angelo Custode." The arch over his head indicates the chapel of St. Augustine's, symbolizing shelter and comfort drawn from the church. The pear tree over that indicates comfort as well. The angel bends caringly towards Browning, with "head turned away" towards the earth, drawn in the upper right. The gates of heaven are open at the top of the medallion, along with the cross potente, a traditional symbol of our Lord's power to heal diseases of people's bodies and souls. The New Zealand-like shoreline recalls that the poem is addressed to Browning's friend, Alfred Domett, in New Zealand. The Good Shepherd in the lower corners of the border and the lamb at the top refer to the line ". . . and gently tether Me, as thy lamb there . . . ." The lily of the valley refers to the return of happiness. The lily symbolizes purity and sweetness. In Christian tradition, it is a symbol for Jesus Christ, the Lamb of God and his life on earth. The water lily at the bottom signifies purity of heart; the magnolia, love of nature and magnificence; the amarylis, pride and splendid beauty. The light flowers and red coloring of these two borders harmonize nicely with the daisy borders of the other windows in the room, depicting "The Boy and the Angel." "The Guardian Angel: A Picture of Fano"
Cleon, the subject of Browning's poem with the same name, is a Greek poet who represents the highest attainment of human intellect. His enlightened soul cries out in anguish for a revelation of God's willingness to live on earth as a man (Incarnation) and for a revelation of a life after death (Immortality). Browning seems to be saying that the human mind at its peak requires these two assurances (Cleon, however, turns away from the possibility offered to him in the New Testament--through Christ). Baylor University is a Christian institution founded on these two cardinal principles; Lily Russell, the Baylor Historian, exemplified the Christian life in all her work at Baylor. The columns in this window are the primary archeological remains of Baylor at Independence, the site where Baylor University was founded in 1845. 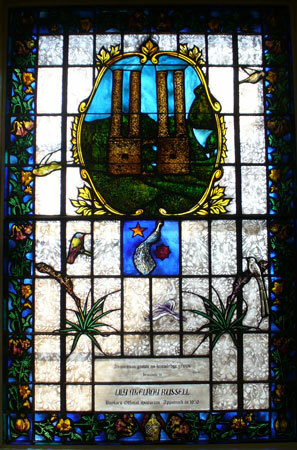 The pomegranates in the four corners of the window are reminiscent of a series of poems titled Bells and Pomegranates, for which Elizabeth Barrett first recognized Robert Browning. The yellow rose in the border represents the song "The Yellow Rose of Texas," a song President Pat Neff frequently requested to be sung at Chapel, and the trumpet creeper is a favorite of the hummingbird. These, and the red honeysuckle, are all native to Texas. The prominently featured coral yucca is especially significant because it was the subject of a study done by Dr. Cornelia Smith. Also, Dr. Smith’s maternal grandfather, John O. Meusebach, sent specimens of yucca from Texas to Dr. George Engelmann for the Missouri State Botanical Garden. The ruby-throated hummingbird and the painting bunting were included for their beauty and colors. The scissortail and inca dove are characteristic of Texas, and the mockingbird is the Texas state bird. Immortality is symbolized by the peacock, and the stars beside it represent Texas with the Lone Star and Christianity with the Star of David.